During the summer of 1998 I was introduced to cosplay when I attended my first anime convention, Otakon. People were walking around dressed up in costume and it wasn’t Halloween. There were Sailor Moon’s galore, and even all of the Iron Chefs! And this is when I fell in love with cosplay. There weren’t quite as many cosplayers back then at those earlier conventions, but over the years as geek culture has become more popular, so too has cosplay. For those of you that don’t know anything about it, Cosplay is a portmanteau of the words costume and roleplay. It’s defined as the art or practice of wearing costumes to portray characters from fiction, especially from manga, animation, and science fiction. Sometimes cosplayers will act as the character they are portraying, but a lot of the time they simply dress as them. I think cosplay has gotten a bad repution, sometimes even within other parts of geek culture. ‘Oh yes, I might be a geek but I’m not one of those geeks.’ Cosplayers are often mocked or made fun of for dressing up or being ‘weird’. But most cosplayers are just like most people; incredibly normal folks with a passion for their favorite hobby. Most of the cosplayers I have encountered over the years attending anime conventions were dressed as anime or game characters, but I’ve also seen characters from a wide variety of sources including western animation, movies, and books. I even saw someone cosplay a cereal mascot! 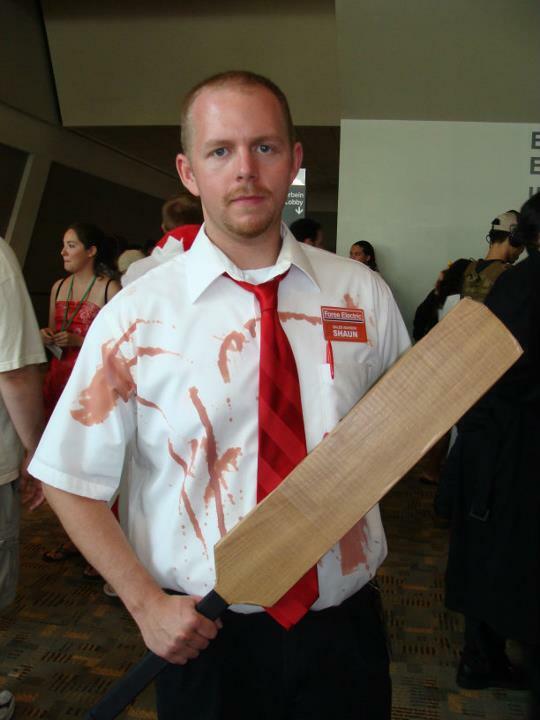 I think my personal favorite was seeing someone cosplay Shaun of the Dead. For me, as an observer to cosplay, it’s great to see people dressed up as your favorite things. It’s like they are wearing a giant badge that says ‘I love the things you love, come talk to me!’ For an introverted person, this really gets me to come out of my shell a little and that’s why I love it. I wanted to gain a little more insight about cosplay from the perspective of someone that actually does it so I interviewed Tyesha aka Afrovixen, a cosplayer from the Baltimore area. How long have you been doing cosplay? Why do you like it? I have been cosplaying for about 3 years. I started off a little rocky in the beginning because I didn’t know a lot about it. I love cosplaying because it gives you a chance to be someone you aren’t on a day to day basis. I am kind of shy person when I am around people that I don’t really know. Cosplaying helps me open up to people more. What first got you interested in cosplay and how did you get started? I went to my first Otakon in 2009 and I seen so many people in these awesome costumes and I thought it was amazing. There were so many people in costume, that I couldn’t believe that I missed out on this for the majority of my life. I soon started to see that it was getting a lot harder for me to go to conventions and not cosplay. Do you make a lot of the costuming yourself or buy items pre-made? Is it expensive is it, on average? Depending on what you are making it can be really expensive. I think the best time to start a new cosplay is at the end of a con. That way you can get everything you need without breaking the bank. I actually have someone who makes my cosplays. I’m not exactly a small woman so it’s not easy just buying them. If I can make a cosplay without sewing, then I will make my own. I can hand sew a little but not enough to make a whole outfit. I am actually working on trying to learn how to sew my own outfits so from now on, whenever I have an idea I can just sit down and start working on it myself. I do make most of my props though. How long does it take you to put together a costume? How long do you typically start working on a costume before an event? It usually takes about a month or two for a cosplay to come together, props and all. That also includes the time it takes for my cosplay to get commissioned. If I actually had more time to work on them throughout the week, it would probably take a little less than that. What was the most complicated/hardest to make costume you’ve ever worked on? I am going to say my Navi (The Legend of Zelda) cosplay was the hardest. I have never had any experience with making wings. I looked up a couple of ways to make them and decided that making my wings with wire hangers would be the easiest and cheapest way to do it. Let me tell you it wasn’t. It took a lot of hangers, a lot of knee highs, and a ton of duck tape to actually get a decent set of wings together. They aren’t the greatest pair of wings but I made them and I was pretty happy. What’s the strangest thing you’ve ever incorporated into a costume and how did you use it? I can’t say that I have used anything strange yet. I am waiting on that day though. I know it will happen. Where do you get your inspiration for ideas of what to cosplay? What characters have you cosplayed as? What characters would you like to do in the future? Why do you think you gravitate toward these types of characters? I think my inspiration is the fun I know I will have acting out the character I decided to cosplay. It’s always fun. I still think I have to work on the acting part more. 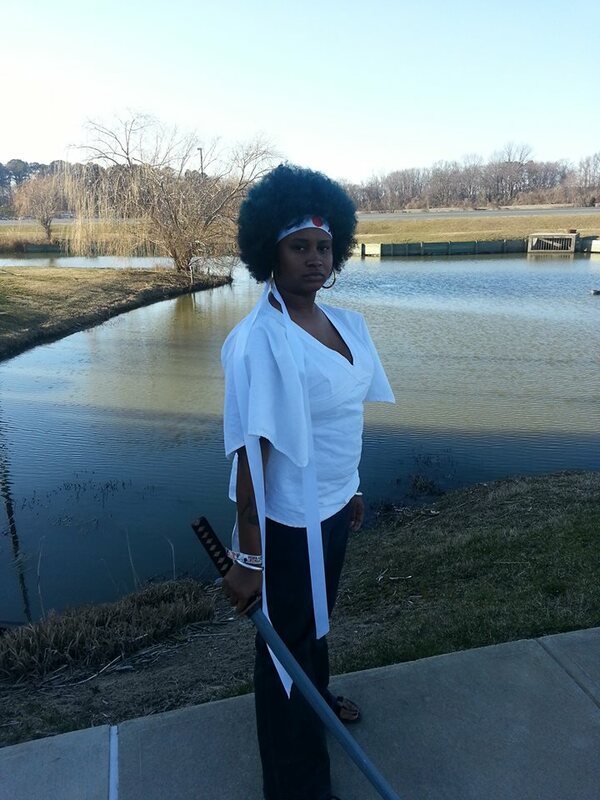 So far I have cosplayed Shinobu (No More Heroes), a white mage (Final Fantasy), Navi (The Legend of Zelda), a female Afro Samurai and Michonne (The Walking Dead comic). I wanted to start out simple so that I wouldn’t get frustrated with myself and just give up. As the years have passed I found a very awesome seamstress. I started to cosplay characters I thought had a totally different personality than my own. They are also characters that I love. I think Michonne is my favorite. I have a few cosplays I want to do in the future but I really want a cosplay where I can make armor. I don’t have a character in mind yet but hopefully I will come across one one day. Where do you cosplay/what events have you attended? Have you ever entered a contest, if so where and what was it like? 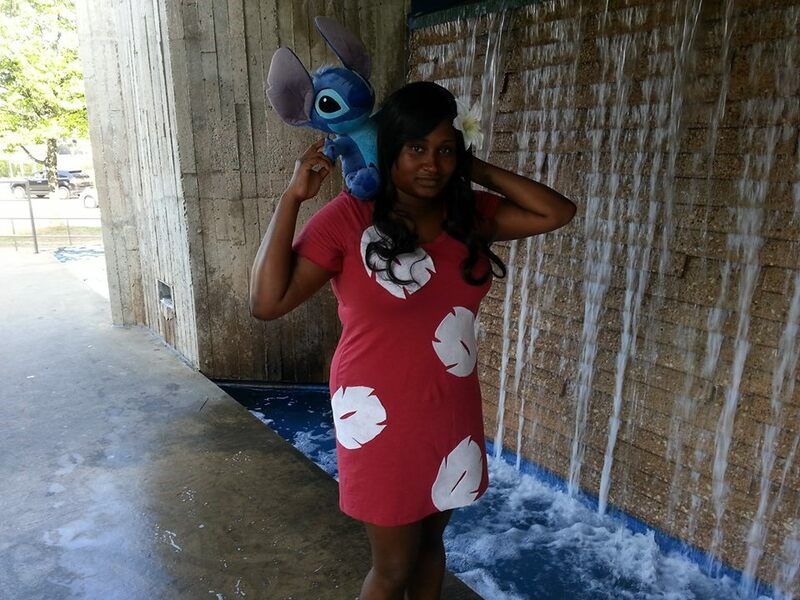 I do most of my cosplaying at Otakon. I do attend Baltimore Comic Con and cosplay but it’s only for a day. I would love to travel around the U.S. to see how other conventions are but my money just won’t allow me to. I entered one contest before and I felt very scared and put on the spot. Haha. It was at a local comic book shop in Baltmore. I think I would do it again, maybe. It wasn’t too bad but like I said it scared the crap out of me to be there. What kinds of reactions do you get to your costumes? Best? Worst? I get pretty good reactions. The best I think was when I cosplayed as Navi and two kids walked up to me and started saying ‘HEY! LISTEN!’ They were both pretty young and the boy started telling me a story. I couldn’t make out much of what he was saying, but I listened. They were really cute. I think the worst reaction I had was no reaction at all. 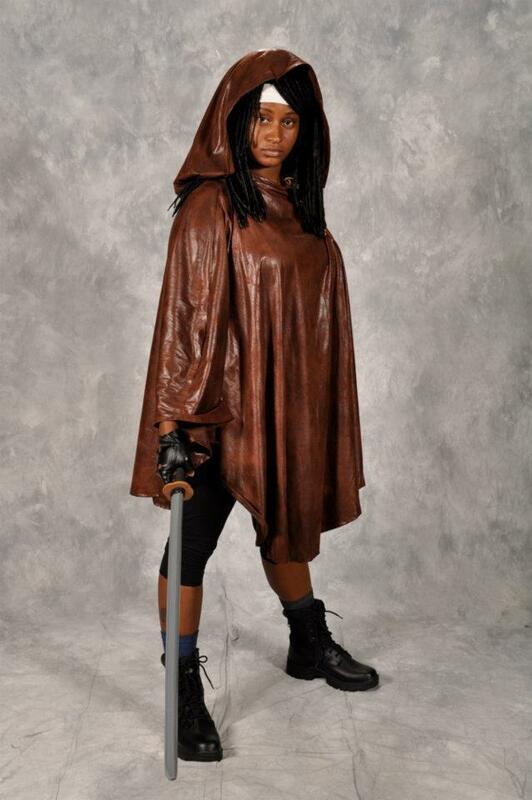 I went to Otakon as Michonne and not a lot of people recognized me but I still enjoyed myself. Are you a member of any cosplay communities/clubs (real life or online)? If so which ones? It’s not a cosplay group but I am apart of a group on Facebook called DMV Anime Watchers. What do you like most about the community? I met some really nice people in the group with similar interest and a lot of them cosplay as well. They also schedule events throughout the year for the group. What problems (if any) do you think there are in the community, and/or what would you like to see change? I see no problems at all. They were nice enough to let me in! Is there anyone in the cosplay community that you look up to or you aspire to be like? Who? I look up to EVERYONE that cosplays. Sometimes this isn’t the easiest thing to do. It takes a lot of hard work and sometimes a lot of self esteem. It takes guts to come out of your house in costume on a day that’s not Halloween. People stare, they talk and they judge. Cosplayers look past all of that and do what they love doing. Can you recommend any sources to check out if someone is interested in getting started in cosplaying? Youtube will be your best friend! What do you think the future holds for you as a cosplayer? Right now it’s a hobby that I really enjoy. I wish I can do it a lot more. I am still learning and I know I have a lot of it to do. Hopefully I will get better at it and continue to do it until I can’t anymore. Is there anything else that you think we should know about cosplay in general or your particular experience with cosplay? I think people should cosplay whomever they want. If you feel comfortable doing it then do it. Everyone should try it at least once. I have had nothing but fun doing cosplaying. To find out a little more about Tyesha’s cosplay you can check out her facebook page here. This is the peice I wrote on Cosplay for Way too Fantasy. My first time intervieiwing someone. I think it came out pretty good.